Tempo Apartment Project Approved For RiverPark, What Next? 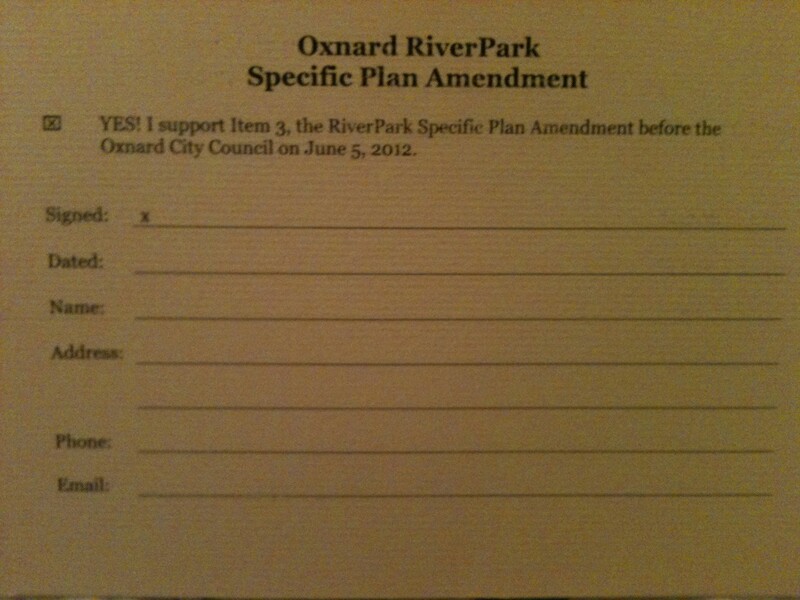 Pending a final review of a comprehensive parking plan, the Oxnard City Council approved an amendment to the RiverPark Specific Plan which will allow the development of a parcel of land at the southwest corner of Myrtle St. and Forest Park Blvd. into a new upscale apartment complex to be named, Tempo Apartments. The new complex will consist of 212 apartments, none of which, will be reserved as Affordable Housing. A card circulated door-to-door to Serenade Apartment residents last Tuesday afternoon. 3 Smart Cars per 2 bedroom unit or 2 Smart Cars and a couple of Vespa Scooters per 2 bedroom apartment. In any case, the city council is requiring that the city’s current parking standard is met, which is room for 2 cars per 2 bedroom unit. Serenade had received the variance in anticipation that public transportation (i.e. The Bus & Segways) would be in wider use throughout RiverPark. They evidently forgot Oxnard is located in Southern California where the term “mass transit” is meaningless. Oh well, at least future Tempo residents will be able to have their visitors park in The Collection parking lot which should be conveniently close by. The original RiverPark Specific Plan allowed for the construction of 320 to 450 high density housing units which could have taken form as condos, townhomes or work/live units as the homes at The Avenue are. The Specific Plan Amendment allows for 212 units, in place of the 320 to 450 in the original plan, not an additional 212 to the 320 to 450. The amendment actually reduces the density level allowed in the original Specific Plan, Section 2.15. Apartment projects were previously approved in RiverPark in what is designated as Planning District F. The approval of the Tempo Apartments in Planning District D adds 212 more apartments to RiverPark but does not add to the original planned density. Max Winegar, Oxnard’s development services director, confirmed that there is no requirement for a new environmental impact report or traffic impact analysis for the proposed Tempo apartments because the RiverPark project originally included more housing and traffic than the current plan. If ultimately approved, the Tempo Apartments will provide additional revenue towards the payment of RiverPark’s Mello Roos fees and increase the number of potential customers for services and products that will be provided at The Collection shopping center at RiverPark. This change in demographics may help lease more commercial space at The Collection and help get RiverPark closer to actually achieving some sort of financial success. Having a vacant concrete ghost town next door is kind of creepy, just ask the Chinese and click on this to have a look. ← RiverPark Residents Eligible To Win $200 In Free Gas!